Since I hold a VCAP-DCD for 5.5, and want to upgrade to the VCIX-DCV 6, I have to study and take the VCAP-DCV Deploy test. Thankfully, VMware has made the process easy – I don’t have to upgrade the VCAP-DCD first to 6.0, as it will count towards my VCIX! So, in order to assist me in studying, I decided to start a study guide series, following the objectives on the test’s blueprint (beta as of now). Look for all posts in the series under the VCAP-DCV – Deploy category from the Menu. 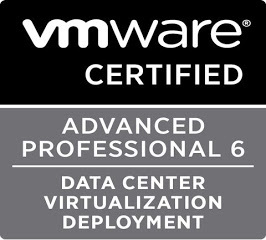 I’m currently learning for VCAP-DCV as well. I have not found a studgy guide for version 6 yet so I will follow this blog closely. Are you planning to update frequently?